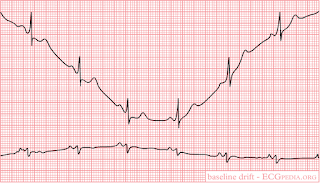 Stupid Heart Rhythms: Which Part of My 12 Lead EKG Should I Use for My Tattoo? This is by far the most common EKG question I receive: "Which part of my 12 lead EKG should I use for my tattoo?" The short answer is that any part of the 12 lead EKG might look good as a tattoo. Since you are using a real life EKG as your pattern, you know that no matter which part you choose, it will be accurate. Most EKG tattoo problems come from people just making up their own squiggly EKG line, which is always disastrous. 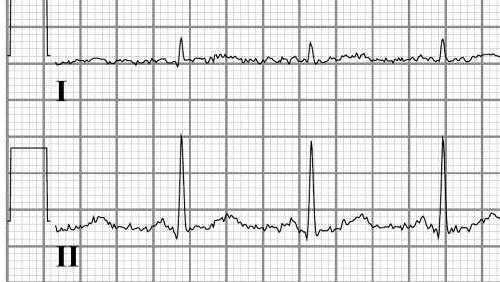 Using a real EKG as a pattern is always a good idea. If the EKG belongs to you or a loved one, the tattoo will have additional meaning. First you need to know a little bit about 12-lead EKGs. It is very common for people to receive 12 lead EKGs when they visit the hospital since they are a cheap, noninvasive procedure which can reveal a number of hidden problems. The graphic above is a 12 Lead EKG I ripped off of google somewhere. It differs from a simple rhythm strip, in that it is not just one long continuous rhythm printout of one electrical view on a thin strip of paper. You can see that the 12 lead shows various electrical views of the heart in sections, and that each view appears to be a bit different in shape and size. Each section is labeled with markers like I, II, III, aVR, aVL, V1, V2, etc. Various parts of the world organize the EKG lead sections a bit differently on the page. How they are ordered is not so important as just knowing that not all 12 lead EKGs will be arranged the same. In the 12 lead above we can see that lead II is printed in two separate spots: far left column, second from the top; and also at the very bottom. The presence of a lead II at the bottom is a matter of equipment and programming, and does not appear on all 12 leads. If the particular machine includes the long lead II strip at the bottom, it is there to give the interpreter a longer run of the heart rhythm to help diagnose various arrhythmias which are not readily apparent within the short window that standard 12 lead views offer. Which lead should you choose? A lot of people worry a lot about this question. Since we know your tattoo will be patterned off a real EKG, the question is really one of aesthetics. Which one looks best to you? Many people choose lead II. Some choose other leads. I do recommend choosing only one lead for the standard EKG tattoo, however, since the shape of the waveforms changes in between leads. So, If you were to use Lead I, I recommend stopping before it changes shape as it moves right across the page into aVR, where it appears to flip upside down. Some artifact will cause your baseline to wander. Notice that in the 12 lead at the top of the page, the various leads all track horizontally across the page. In the picture below, the rhythm takes a huge dip off the isoelectric line. This can be caused by the machine calibrating itself during monitoring. Some artifact can be caused by movement such as shivering, Parkinson's tremors, or Italians talking with their hands. It can also be caused by dried up gel on your electrode stickers, and any condition which causes a poor connection to the patient's skin. You can see how the pattern turns to garbage in the middle of the rhythm strip below. 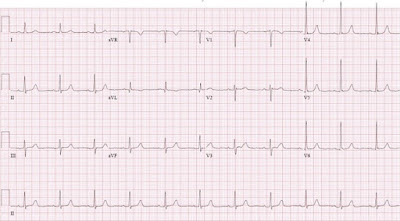 A trained eye can tell this type of artifact from other arrhythmias like ventricular fibrillation, which can have a vaguely similar appearance. Some artifact can be caused by interference from overhead lights and other nearby electrical appliances, causing a jagged, rough, fine irregular sawtooth appearance to the rhythm. This is difficult for the untrained eye to differentiate because this can closely mimic an arrhythmia called atrial fibrillation. 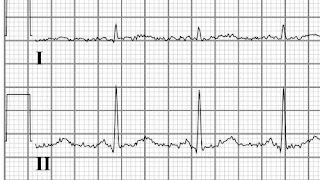 The picture below shows artifact distorting a normal rhythm, but the rhythm could be very easily mistaken for a-fib by a student or someone who doesn't know exactly what to look for. 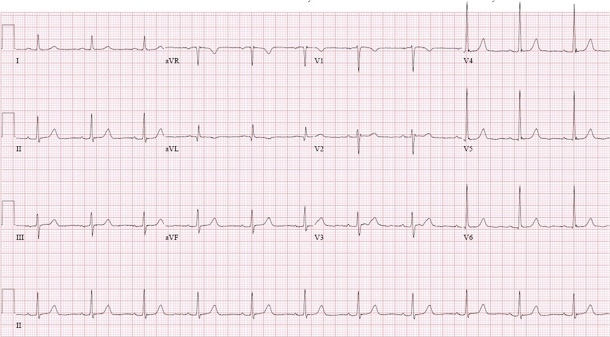 In some cases you can trace over the EKG and smooth out the lines through areas where artifact is present, but sometimes the artifact is so bad that you just have to cut your losses and find another way. When in doubt about whether or not something contains artifact, always ask someone who knows what they're looking at before getting it tattooed onto your body forever. You are welcome to email me for free advice at healthcaretattoos@gmail.com.